44 years ago, the Apollo 14 mission landed on the surface of the moon. Captain Alan Bartlett Shepard, Jr, Major Stuart Allen Roosa, and Commander Edgar Dean Mitchell helped reestablish confidence in our space program after the prior mission, Apollo 13, suffered an explosion on board and had to return to Earth. This group of brave astronauts, like most from the early NASA days, were white men. As our astronaut pool becomes more diverse, there is more of a chance for space missions to truly reflect the diversity of our population. Image Credit: NASA. 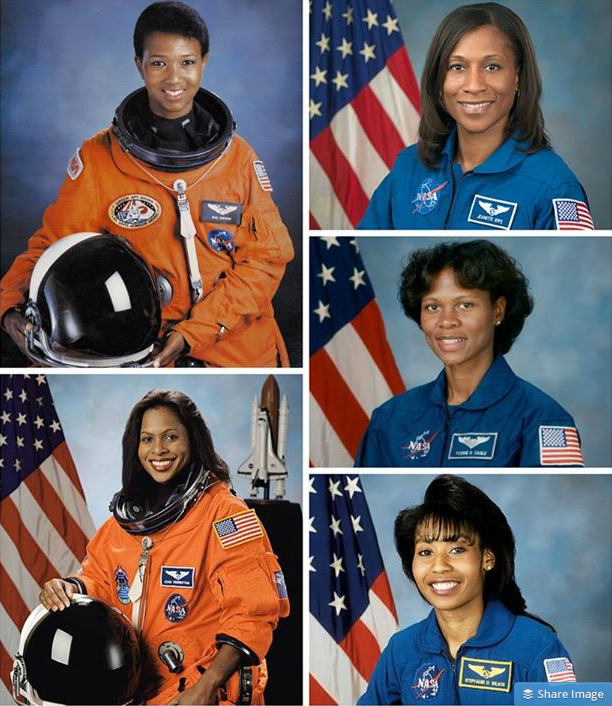 Pictured clockwise, starting from top L: Mae Jemison, Jeanette Epps, Yvonnne Cagle, Stephanie Wilson, and Joan Higginbotham. Mae Jemison (retired) - served as a science mission specialist during her historic flight to become the first Black woman in space in 1992 (yes, almost 30 years after we started sending people in space). Joan Higginbotham (retired) - worked on the shuttle payload bay reconfiguration for all shuttle missions and conducted electrical compatibility tests for all payloads flown aboard the shuttle. Imagine looking at a NASA photo in the future with these women walking on the surface of another planet or moon. It will happen, and it will be as inspirational as seeing an African American US president. Diversity matters - let's make it happen!